Ants navigate and communicate directions in different ways depending on the kind of ant and the circumstances. In general, ants find their way home by sight, using landmarks and the sun's position the same way people find their way around during the day without compasses, maps and GPS. Dung beetles orient themselves by using the Milky Way, but ants and other insects don't seem to navigate by the stars. The possibility of becoming lost generally isn't an issue for ants. With their multifaceted eyes, ants come equipped to make visual use of their environment. They go after nearby food sources, making their foraging time efficient. They also organize their food foraging to reuse familiar paths. When the time comes to build a new colony, winged male and female ants fly to a site nearby, finding each other by pheromones. Pheromones are chemical signals that convey information, in this case, attracting the male ants to a new queen. These new colonists are ants that are able to breed, an ability that not all ants possess. Leaf-cutter ants, the farmers of the ant world, find their way home by leaving a scent trail. 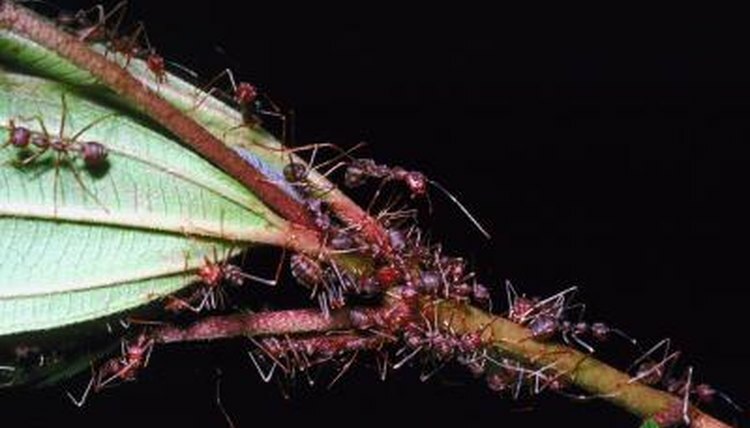 Unlike many common ants, leaf-cutters travel far from their nests in search of leaves. They grow fungus on the leaves for food, after chewing the leaves up to prepare them. They live in underground colonies and eat the fungus, not the leaves. Because their journeys are farther and more complicated, the scent trail serves to keep them on track. Saharan desert ants find their way home after foraging in different directions across the sand by orienting themselves with the sun. They also have the ability to determine distances, apparently based on their stride. German researchers discovered ants on stilts which gave them a longer stride travelled too far and missed their destination, the University of Georgia website reports. It seems these ants are able to count their steps, and even when they've been searching in different areas for food, they follow a straight path the exact distance back to their home. Ants feed on pests, getting rid of more larvae than pesticides do, according to the University of Arizona Master Gardener Journal. They aerate the soil, and serve as pollinators, helping garden plants. They possess amazing strength for their small sizes, carrying bits of food many times heavier than their bodies. Ants work together, and they keep their trails clear to make it easy to get to their food sources and back.